Over the Holiday Season important donations came in to fund three “Watch for Foxes” road signs. In the past few years cars have become the most common cause of death for island foxes. While the northern islands have few cars operated only by National Park and Nature Conservancy officials, Santa Catalina has a number of roads and a variety of people driving on them. The two Navy islands, San Clemente and San Nicolas, also have roads with fast-moving vehicles. 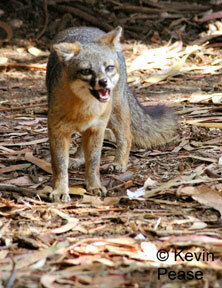 This autumn several island foxes lost their lives on Santa Catalina Island along the road from the airport into Avalon. These “Watch for Foxes” signs will help remind drivers to slow down and be especially vigilant when driving this section of road. 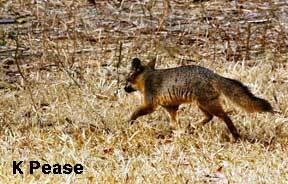 Because of the island fox’s small size, it can be hard to see before it darts onto a road. 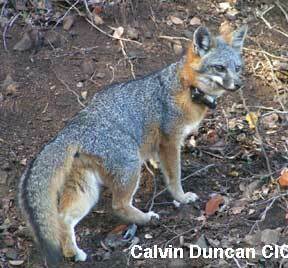 The fox’s mottled gray coloring with tinges of russet, provide amazing camouflage in island chaparral and grass. Especially at twilight, even careful drivers can sometimes accidentally strike an island fox crossing the road. While female island foxes usually stay near their parent’s territory, young males may travel great distances looking for territories of their own. These adventuring teenage boys tend to be inexperienced and many have their lives cut short along dangerous roadsides. Accidents can happen. Drivers on Santa Catalina, San Nicolas and San Clemente are reminded that it is important to report incidents where island foxes are believed to be hit by cars. Injured animals can not be helped if accidents are not reported and the body of an animal killed by a car may provide important medical information if the carcass is collected in a timely manner. Hopefully with the new “Watch for Foxes” signs funded by donations to Friends of the Island Fox this Holiday Season, island foxes will be safer along island roads this spring. As we venture into 2011 Friends of the Island Fox is joining with the Channel Islands Park Foundation, the non-profit foundation that supports Channel Islands National Park. This new relationship will expand our ability to educate the local community about the endangered island fox and its connection with the Channel Island ecosystem. School programs will continue and grow to include additional island topics. We will continue to support conservation efforts and research across all six of the California islands that are home to the island fox. Your donations will continue to work directly for island fox conservation. Please note that when you use the "Donation" buttons at the upper right, donations will be processed through the Channel Islands Park Foundation but will be designated for the Friends of the Island Fox program.